My son actually started crying when he saw these curtains hanging in his room. He was convinced that I had cut up his beloved blankie. In a way this was true, but not the way that he thought. I had cut the end off of his adult-sized duvet cover a month before and shortened it into one that fit his kid-sized one. Why this sheet set doesn’t come in child-size at Ikea, I will never understand. 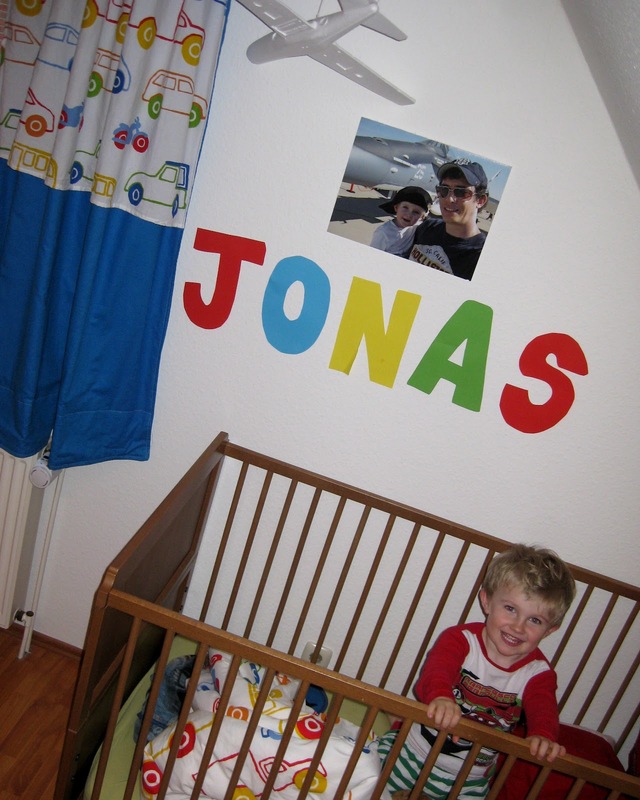 The idea that Jonas wouldn’t like his matching curtains never occurred to me. Luckily, after taking his blankie out of his bed and showing him that it was whole, he quieted down and it was all okay. We even had a little conversation and a smile about the dump trucks and cars. Thank goodness! 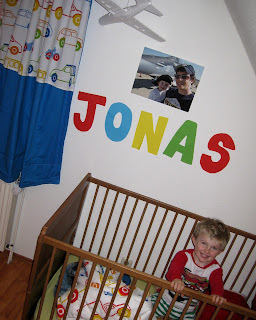 His room needed curtains since summer is approaching and it is light here in northern Germany until almost 11 p.m. Without anything on the windows, he would most likely wake up around 4 a.m. as well when it starts to get light outside. I’m not the biggest fan of curtains, but I didn’t want to have blinds due to the cords. I’ll admit, I bought curtains for the main bedrooms. With the price of material these days, it’s hard to sew them for less. However, they are too thin, so I will need to sew on a darker sheet behind them to block out more light. Good thing I can sew. 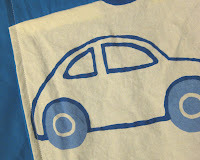 For this duvet inspired curtain, I used some scraps of red material, a long piece of blue material I bought at Ikea, the bottom end of one of the bedroom curtains (cut off at the window), and the rest of the duvet cover with the automobiles. It only took me one night after the kids went to bed, and I think it really adds to the room and makes it more colorful. 1. Measure the window and buy enough material for a base curtain with the material folded in half. 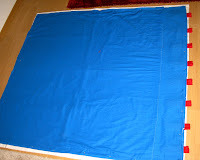 I decided on blue and needed 1m40 x 2.5m (about 55” x 98”). Trivia for you - European windows are different than American ones. You can open them into the room to clean them or open them at an angle to let in a little bit of air. Since there aren’t as many insects here, almost no windows have screens. 2. I first made the loops for the top of the curtain. This is pretty easy. All you need to do is cut a few strips of material 4 inches by 10. 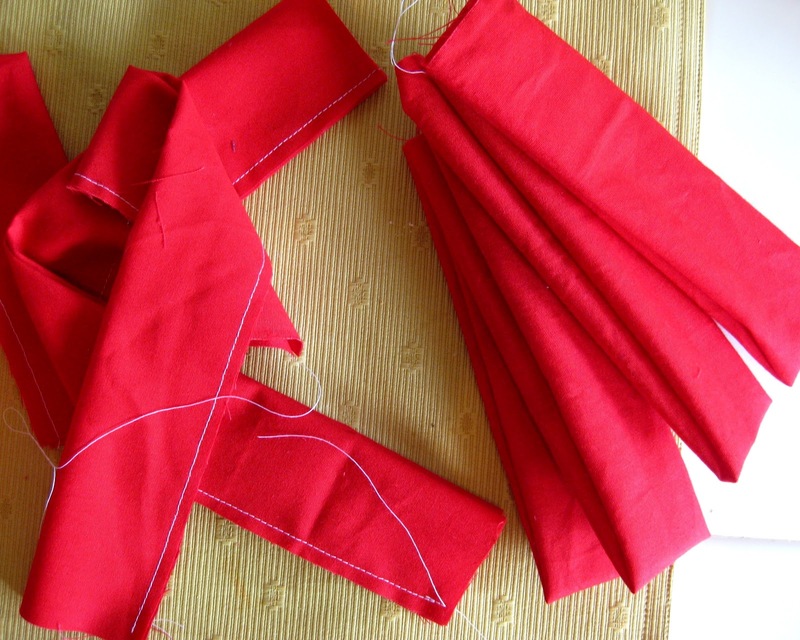 Fold them in half and sew along the side leaving about a quarter inch. Then turn them back right-side-in and iron flat with the seam in the middle. 3. Then I folded my blue material in half and laid it on the floor. I cut open the fold so that I would have a straight cut and folded back one piece at the top. Now I laid the red loops along the top of the material with the frayed ends hanging off the side of the blue material on the floor showing about an inch. I pinned them loosely in place. Then I folded the blue material back over the loops and added more pins. Finally, I sewed along the top leaving about a quarter to a half inch of blue material. After you have made your seam, you can cut the rest of the loop ends also to a quarter inch. Now you can turn this piece of material inside out and lay it back on the floor. With the loops on the top, it already looks like a curtain! 4. At this point, I decided to add the automobile duvet piece of material to the curtain. I ripped out the seams and then cut the material to fit. Then I sewed in the bottom edge a quarter inch. Finally, I sewed this piece upside down on the blue material about a foot from the top seam with the loops so that when it is folded back over it hangs like a second curtain over the blue one. 5. 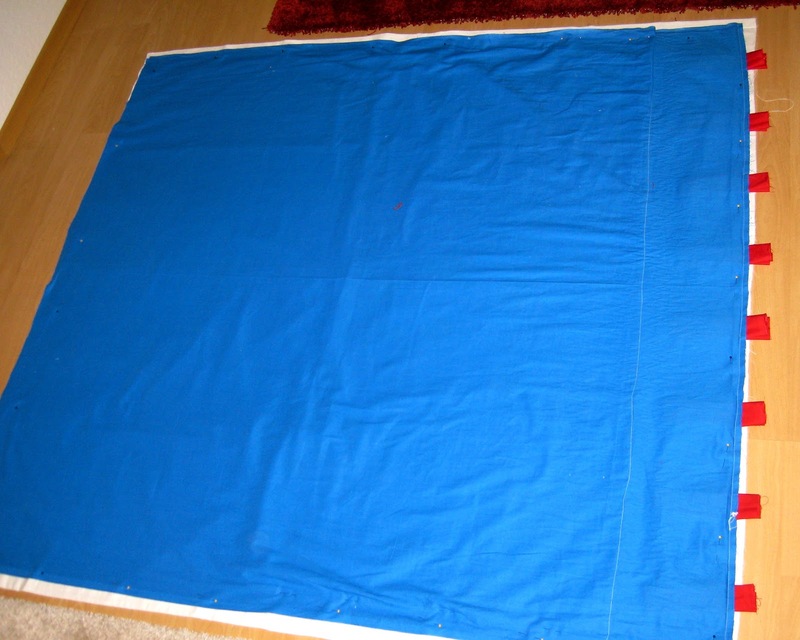 I folded the blue curtain back inside out and laid it on the floor like in step 3. Then, I took the rest of my bedroom curtain material and laid it on the floor underneath the blue curtain. I added this piece just for extra opacity. I made sure everything was flat, pinned the edges, and then cut off any extra material sticking out. I sewed around the entire edge, leaving only a little hole, about 8 inches, along one side. Then I turned the whole curtain back right-side-in. 6. At this point, the curtain looks a bit like a duvet cover. In order to make it look more like a curtain, I sewed around the edges again and then sewed another seam a few inches from the bottom so that it looked like a hem. Love it! I picked up some fabric and made son some curtains with this fabric as well as a bumper crib and pillow case to match. I wish they had it in child size sheets as well! But I love the red tabs at the top! I might rip mine up and do the tabs as well... I did mine with a slot to put a tension rod through... the red tabs would look so much better!! I also used a blue single size sheet for the blue contrast fabric from ASDA. I'm cheap like that haha but it worked great. Love your blog I just came across it while browsing on google!